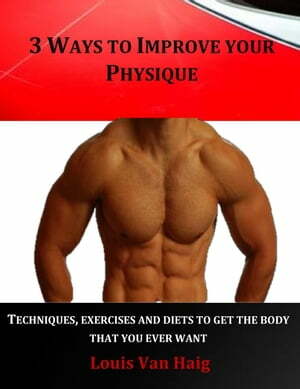 Collins Booksellers - 3 Ways to Improve your Physique by Louis Van Haig, 9781519933072. Buy this book online. I want to thank you for downloading and read this book: 3 Ways to improve your Physique. Here you will find techniques and exercises proven by the author. If you have tried every exercise, supplement or technique to develop more muscle and to be in shape, and all what you have got was a waste of time or just you are a beginner trying to put more pounds to your body, then you must read this book. These exercises and techniques are very effective to lose body fat and to have a toned body. I found in a scientific way that all the exercises in this book work, for years I have tried many routines, supplements and diets to gain muscle and tone my muscles; I read magazines, asked to guys in local gym but I received wrong information from wrong people. I decided plan a scientific method to obtain more muscle and less fat in the same time. You do not need complicated equipment and expensive gyms to do these exercises. Do not do everything what inexperienced people tell you just listen to your body and use all information contained in this book and you will get amazing results. One important thing you keep in mind is: be patient, nothing comes overnight. In this business all is a balance. To obtain the results you want you must combine right exercise, right diet and right techniques that’s all friends.